Montana DUI Penalties | Consequences of Montana DUI Overview | DUI Penalties Including Jail Time, Fines, License Suspension, Etc. Imprisonment: Minimum 24 hours consecutive hours in county jail - Maximum 6 months. If passenger under 16 years of age in vehicle: 48 hours - 12 months. Chemical Dependency Assessment and Education Course (ACT Program): Required. Driver's License Suspension: 6 months. Possibility of restricted probationary license for "essential driving only." Imprisonment: Maximum 10 days. If passenger under 16 years of age in vehicle: Maximum 20 days. Fines: $300 - $1,000. If passenger under 16 years of age in vehicle: $600 - $2,000. Driver's License Suspension: 1 year. Imprisonment: 5 days - 30 days. If passenger under 16 years of age in vehicle: 10 days - 60 days. Fines: $600 - $1,000. If passenger under 16 years of age in vehicle: $1,200 - $2,000. Imprisonment: 30 days - 1 year. 10 days of imprisonment nonsuspendible If passenger under 16 years of age in vehicle: 60 days - 1 year. Fines: $1000 - $5,000. If passenger under 16 years of age in vehicle: $2,000 - $10,000. In addition, defendant must pay cost of imprisonment if financially able. Fines: $1,000 - $5,000. If passenger under 16 years of age in vehicle: $2,000 - $10,000. 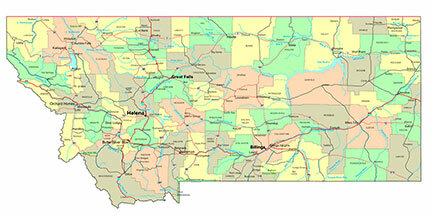 The skilled Montana DUI lawyers on this site can help you with all aspects of your drunk driving arrest including: further information on DUI penalties, fines, and consequences, administrative driver's license suspension or revocation, Under 21 DUI Drunk Driving and Zero Tolerance Laws, SR-22 insurance, DUI School, Mothers Against Drunk Driving (MADD) Victim Impact Panels, how to beat a DUI, Ignition Interlock Devices, SCRAM Continuous Alcohol Monitoring Device, DUI Expungement, DUI Diversion, Community Service, and all other issues surrounding your Montana Drunk Driving DUI Arrest. Montana DUI Attorneys can help fight for your Rights following a DUI arrest in Billings, Great Falls, Missoula, or anywhere else in Montana.